Communist Party Statement on "Health Care Victory"
The Communist Party USA has issued a statement on Obama's "Health care victory". Its a classic piece of communist double-speak, but there is some truth and some very clear warnings buried in the propaganda. Almost every sector of American society greeted yesterday's signing of a historic health care law as a major step toward guaranteeing affordable health insurance for all. Labor unions, health care professionals, small business owners, retirees, students, and ordinary people from throughout the country applauded President Obama and Speaker of the House Nancy Pelosi for having the tenacity to push through what's being called the most sweeping health care legislation since the establishment of Medicare in the 1960s. That means if you opposed Obamacare, you are in the minority and don't count. Beyond that, its passage is a major defeat for the far right - the Republican Party, sections of Corporate America, and their fascist-like tea party shock troops. The enactment of this bill is an enormous victory for the broad progressive movement in our country. It will give energy and enthusiasm to that movement as it mobilizes and builds for the struggles ahead to advance a pro-worker, pro-people agenda. The far right has been left glaringly isolated but perhaps even more dangerously aggressive. These racist hate-mongers fought viciously to block the bill on behalf of the nation's insurance companies and now say they will continue their dirty campaign by trying to repeal it. But it's clear that an energized people's movement will not let that happen. That means physically confronting the "Tea Party" movement with union goons, thugs etc. Ordinary patriotic Americans are now "far right" and "racist hate-mongers" didn't you know? The fight isn't over. The corporate-backed far right will continue to use racism, lies and anti-government conspiracy theories to try to scare and confuse people. We got some ugly glimpses of this just as Congress was on the eve of passing the health care bill. Tea party protesters in Ohio yelled at and abused a man with Parkinson's disease because he was courageous enough to show his support for health care reform. In Washington, others yelled racist and homophobic epithets at members of Congress. Almost certainly both staged propaganda incidents. "Tea Partiers" will be smeared at every opportunity. After almost a year of lobbying, demonstrations, petitions, rallies, health care story collections, town hall meetings, this is a moment to savor a hard-fought victory. And it's a moment to celebrate the persistence and tenacity of the people's movement for progressive change - a good thing since there are many more battles ahead. Well one thing is clear, the Commies are friends of Obama. Obama can say all day long he's not a Socialist, but then Commie's lie, so that that for what it's worth. And the Saul Alinsky tactics are hitting the airwaves. I was at the Capitol on Saturday. What struck me the most? The families. Long, tidy, QUIET lines waiting patiently to enter the Rayburn Bldg to see their ELECTED Representatives, lines that included families with children in strollers. The kind faces of people from Iowa, Michigan, Connecticut, etc. A young pre-med student, very clean-cut, from NC State. He and his mother had driven up because they believe this Bill to be a tremendous error. The kind exchanges I saw between the police, security people, and the Tea Party folks. Seriously. A long, reasoned exchange between a young man with a small Peace-Sign flag and an older gentleman. They disagreed with one another, calmly, had a long discussion. I guess the most disturbing moment for me was after the major rally, prior to the circling of the Capitol and praying. A group of Capitol Hill folk, too far from us to be identified, were standing outside of one of those beautiful side windows. Here we were, down below, begging to be heard and considered, standing for hours. I was in pain from all the standing. Above were these well-dressed government employees or even Representatives or Senators, I couldn't tell for sure, coming outside from these palatial windows. Behind them were chandeliers. Lovely. We were separated from them by a wide swath of grass, perhaps even a stone wall. I'm not sure of that. They were elevated well above us, looking down on us. Some of them took photos of us with their cell phones. But, for the most part, they seemed bent on ignoring us. Someone near me mentioned the beauty of the building -- that it was like a palace. I grew chilled (although it was a hot and sunny day). He was right. It was as though we were looking at royalty, standing far above us, who were living in great wealth paid for by our tax money. I wanted to weep. Have we indeed created a ruling elite? And has that ruling elite been infiltrated by Marxists and Maoists and socialists? This approval piece by the Communist Party certainly suggests it. And if you listen to the media right now -- with their Saul Alinsky patter of the dangers of violence from the "right-wing extremists" -- you would certainly believe that the media has been thoroughly infiltrated as well. I saw no violence, heard no violence, on Saturday. I saw professionals, blue collar workers, people in wheelchairs, children, young men bearing American flags. I heard people chanting, yes, wanting so much to be heard above the bribery, above the arm-twisting, above the ideological din coming out of Congress. We don't need some elderly gent from the government to tell us that this BIll is all about controlling people. We've already figured that out. Please call your representatives and ask them how they could vote for such racist legislation. The 10% tanning bed tax starts this week and I consider it racist. Compulsory private health insurance? What is their game? What is the difference between the democrat party and the communist party? Ha! All this talk of corporate financed tea parties....I am quite familiar with them and they are on shoestring budgets of small donations from individuals...most who don't have money to spare, but believe in our freedom. "PFLP Solidarity Campaign transfers funds to Palestinian Resistance"
Due to the generosity and support of progressive people in New Zealand for the Popular Front for the Liberation of Palestine (PFLP) and the Palestinian cause, the PFLP solidarity campaign are happy to announce the first transfer of funds. One Thousand NZ Dollars raised by the campaign has been received by the Popular Front for the Liberation of Palestine for their use in whatever manner they deem most effective in resisting ongoing Israeli oppression, racism and military occupation. The majority of the money has been raised through the sale of “Resistance is not Terrorism” t-shirts throughout the country. A new t-shirt is being designed featuring Leila Khaled, PFLP activist and resistance fighter, and will be released at a nationwide launch on the anniversary of the creation of the Zionist state of Israel, known by Palestinians as the “Nakba”, or catastrophe, on May 15th. The campaign seeks to challenge the political paradigm that allows legitimate National Liberation movements to be labelled as terrorist organisations, and the undemocratic way in which terrorist laws are administered. Prime Minister John Key recently added organisations to the ‘terrorist list’ in New Zealand, with no consultation, justifying it by stating they engaged in “terrorist acts including the indiscriminate killing of civilians and assassination of political leaders.” This statement lacks any credibility when New Zealand’s government seeks to strengthen links with the state of Israel that targets and kills political leaders, trade unionists, writers, cultural exemplars, community activists, local leaders, and student organisers while waging an economic and military war against a civilian population that has been under the tyranny of the longest running illegal military occupation in recent history. Almost every sector of American society greeted yesterday's signing of a historic health care law as a major step toward FORCED health insurance and loss of personal freedom for all. 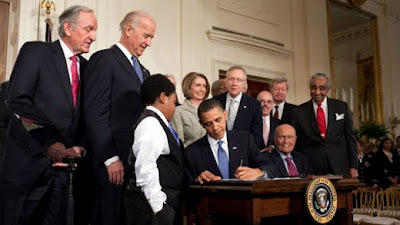 Health care professionals, small business owners, retirees, students, and ordinary people from throughout the country were appalled at President Obama and Speaker of the House Nancy Pelosi for having the tenacity to push through what's being called the most convoluted and expensive boondoggle in health care legislation since the establishment of Medicare in the 1960s. We join with those who hail this legislation both as a measure that will shorten lives and drive the insurance industry out of business (like they did the mortgage companies, resulting in massive bankruptcies & foreclosures), and with no research to prove that it will ever provide quality, affordable health care for every person in the United States. Beyond that, its passage is a major win for the far left - The Democratic Party, sections of political America, and their fascist-like, tea party-hating vigilantes. The enactment of this bill is an enormous victory for the broad progressive movement in our country. It will give energy and enthusiasm to that movement as it mobilizes and builds for the struggles ahead to advance an oppressive, anti-worker, enslavement of the people through rules, laws, fines & taxes agenda, just like Communism. The far left, our politicians and their thugs, are becoming even more dangerously aggressive. These racist hate-mongers fought viciously to block the will of the voting people, on behalf of the nation's insurance companies and now say they will continue their dirty campaign by blocking attemps to repeal it. It's clear that our facist leaders want a people's socialist movement to happen. The fight isn't over. The political-backed far left will continue to use racism, lies and anti-taxpayer conspiracy theories to try to repress, scare and confuse people. We got ugly glimpses of this just as Congress was on the eve of passing the health care bill. Democratic representatives refused to take calls from constituents & wage earners who were concerned that their health care freedoms would be trampled. Calling it harassment, these greedy politicians called federal agents to arrest anyone requesting their rep vote no. Congress continues to smear reputations, threaten constituents, and label anyone who doesn't agree with them a 'racist, lying, tea-party hate-monger'. After almost a year of lobbying, demonstrations, petitions, rallies, health care story collections, town hall meetings, this is a moment to condemn a backroom politics victory. And it's a warning moment of the persistence and tenacity of the people's movement for progressive change - a bad thing since there are many more battles ahead. Obama, Pelosi, and the lawmakers who voted for the health care bill had their way when it was passed into law. This only means that they have no regard for the people. They are not after the welfare of the people, instead they are after their own welfare and those whose interests they protect. It's all very disappointing!